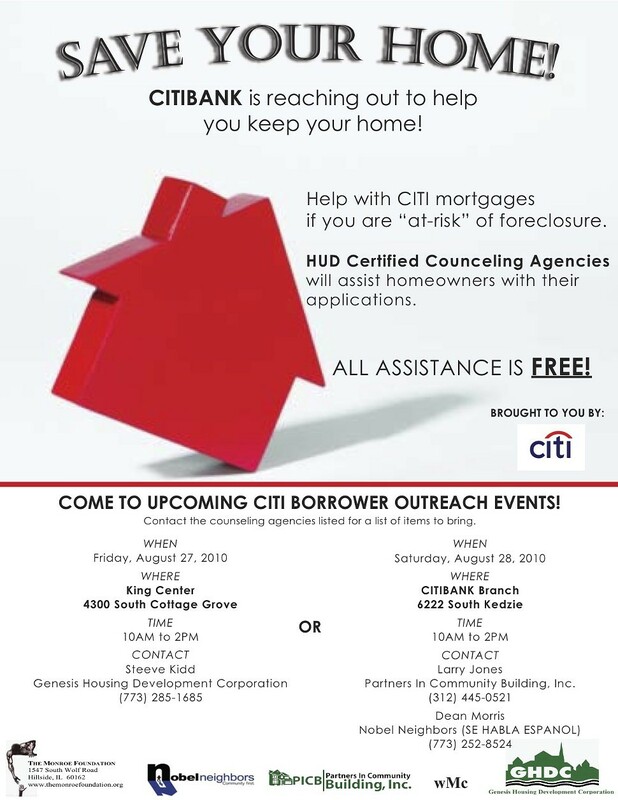 Tomorrow from 11 AM to 2 PM at the King Center (4300 S. Cottage Grove), reps from counseling agencies approved by the U.S. Department of Housing and Urban Development will help homeowners with Citi mortgages who are at risk of foreclosure apply for mortgage assistance. Another borrower outreach event takes place on Sat 8/28 at the Citibank branch at 6222 S. Kedzie, also from 10 AM to 2 PM. Citibank is sponsoring both events. Contact the agencies for a list of items to bring: For Friday's event, call Steve Kidd of the Genesis Housing Development Corporation at 773-285-1685, and for Saturday's event, contact either Larry Jones of Partners in Community Building, Inc. (312-445-0521) or Dean Morris of Nobel Neighbors (773-252-8524).